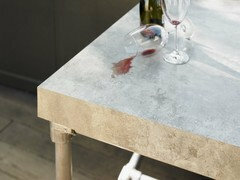 I really like the 'Fresh Concrete' colour but the Caesarstone website says: "Whilst the finish may require more care than our polished surfaces, the Concrete finish enhances the authentic look, yet never requires sealing and remains easy to clean and maintain". Do you think it would be suitable for a hard-working kitchen (family of 5)? When they say "require more care", does that mean it would be more prone to chipping/scratching/staining than the polished surfaces?? Just reading the comments, I have a sample of sleek concrete and have put tea, oil and curry powder on it and left for 10 minutes, it just wiped off with glass cleaner. Will test it further. shelley_y -- I can completely relate. Have had sleek concrete now for 2 years. I love the look when it is spotless -- but we have TONS of windows and we live in California so the sun shines most days. It drives me crazy -- I know it's "clean" but it doesn't look clean! If I had it to do over again I would choose another product still with the concrete look, but something that didn't show every spot. The good thing is I've found the only thing that stains (but eventually wears off) is any marinade that has turmeric in it! BUT you do have to make sure you wipe up red wine spills pretty quickly! We are looking at Caesarstone Raw Concrete instead of Marble as originally selected and I can't see how it will be any harder to maintain. 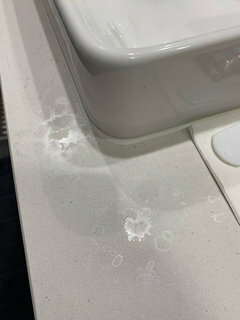 I love the look of concrete and all the blemishes but want something easier to install, so I hope that this Caesarstone does age more like concrete. I'm not fussed about fingerprints and marks, this gives a more worn in look. I guess if you are too fussy about this go for some sort of gloss finish. Wish I had read this page before we installed the sleek concrete. Looks good, feels nice, but I am wiping it down all the time, looks bad after even minimal use. We have two young boys and this stone is not suitable!!! My question is: has anyone tried sealing it to get a gloss finish? I know the ceasar stone website says it doesnt need sealing, but can it be sealed anyway? 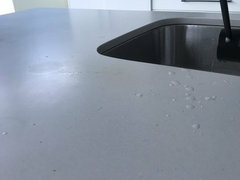 Thinking about contacting a professional to come and seal it, but wondered if anyone else has had any luck with a sealant for the sleek concrete bench top? 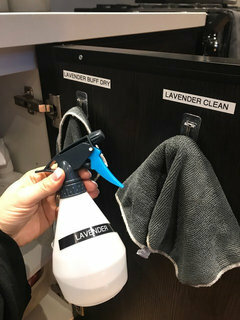 Aaron , when you wipe it use water in a spray bottle with some lavender oil with a. Microfibre cloth. Then quickly dry with a different microfiber cloth. We have this system at home and it's not that hard. I have 4 kids and work full time so not heaps of time for bench care and this works really well. Ours is the fresh which is white so probably shows less but give it a go before you seal it. I can see sealer wearing off and being a nightmare to be honest. I would avoid it. i did a lot of work for a large company that sold marble, stone and alike counters and we used to tell people that concrete is not great to be sealed as it does not last long and will need to be resealed. my suggestion is try to lavender that every one is talking about. As i have said previously i personally would never recommend concrete but some people say its not a big deal cleaning it. I have it in my bathrooms and I love it but it would be pretty hard to look after in a kitchen. Nelson interior designers, it's not actually concrete.. it's still a man made stone . It's just designed to give the appearance of concrete. thank you Breanne. I do know that. I guess i did not make it clear in what i said. Its only my opinion but as i said i really am not keen on it and many designers agree. I’ve now had the raw concrete installed in two bathrooms and powder room , also laundry and kitchenette bench and the fresh concrete in the pantry . So far I love it . Doesn’t seem at all difficult to care for . Very happy with . It has a nice organic look and I love the ‘imperfections ‘ in the texture , that is part of its charm . Hi Sonia - could you please post some photos? Melmcevoy Would be happy to . Give me a little time . It’s still a building site . Cheers . 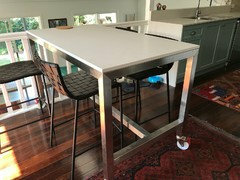 After viewing all the comments on this site, and worrying about the marks and upkeep of Fresh Concrete Caesarstone, I went with my heart and put these benchtops in my kitchen. I absolutely LOVE them, they look so cool, I love the flecks of black and grey and veins of white which are so subtle. The Matt finish is perfect. We had decided we weren’t going to sweat it if it showed marks, and to be honest, it isn’t that bad. We have been cooking for about 2 weeks now and have no issues or complaints, we are very very happy. We also had a table made and used this as the top and we love that too. I have the white and the raw concrete in the bathrooms and also love it. Cesear stone actually sell cleaners that you can use, I have them but now I only use Enjo products....just Too easy. We’ve been in our house 4 months now. I chose Fresh Concrete for the kitchen, all bathrooms and laundry. I freaked out at first. Don’t do this, don’t do that lol. I have come to realise that the marks do come out. Finger prints do come off. I don’t stress so much now, as a quick wipe over and polish with a tea towel cleans it well. My husband thinks differently. It’s driving him nuts. Especially after the grandkids have been here. He’s talking if replacing it but I’m not ready for that yet. I’ll just have to make sure it’s 100% spotless for his highness lol. Having said all that, I wouldn’t get it again but I never get the same thing twice anyway. Hi , I’m thinking about installing the rugged concrete .. not sure about the MATT finish .. had anyone used it with black kitchen doors .. just not sure if the rugged MATT finish will look good , your thoughts pls ? Scroll up on this lengthy post and you will see some reviews. Vince , I think it would look great with black doors . 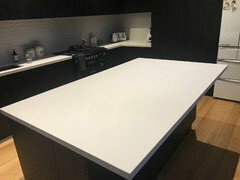 I am just about to get raw concrete caesarstone benchtops but after reading this i a worried- is it all that bad to clean? What is it like around the sink with water splashes?? it’s is fantastic and easy to clean I absolutely love it - i just use Jiff and then I go over it after I have rinsed with a microfibre cloth. @mikimoo it’s fine around the basin . No problem . I love mine . I love the look and feel of it (Raw Concrete) when it’s just been cleaned but it requires a ridiculous amount of upkeep. Steer clear of this or at least do your research!! I am not a perfectionist but I want my new (now 2yr old) kitchen to look good! This product is not fit for purpose in my opinion. So over it I can’t be bothered pursuing Caesarstone. I have the fresh concrete and the raw concrete in different bathrooms. They do leave water marks and ring marks. I have the Caesar stone cleaning products including their wipes which I use. Really nothing else works. They do work, I’m very happy with them in the bathroom but maybe a touch annoying in the kitchen. @Tilley try lavender oil . It woks beautifully for me . Whoops ... meant to say thanks Sonia for your suggestion and I will try the lavender oil. Like Tracye, I too use enjo but with the odd spray of the Caesar stone spray. Here's how they look on day one fresh out of the bubble-pack. And from this angle you can see the matte look of the two honed samples on the left compared to the slightly glossier Nougat sample on the right. Love it. I'm looking forward to the results. 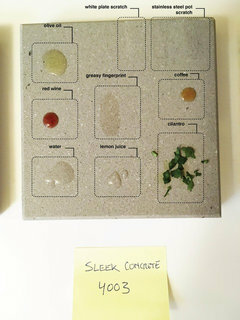 I have been testing my samples of Raw Concrete with a variety of stains, and for me so far so good, so it will be interesting to see your much more scientific testing! I look forward to seeing the results. 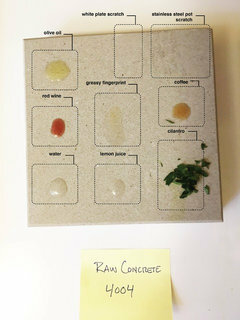 I have been conducting my own testing over the last month on the raw concrete samples i have and so far so good, so be interesting to see your results. Avocado is also a good one to test. You should have ordered the Fresh Concrete too Stuart! What I find is it doesn’t “stain” so much - it watermarks. I don't think we have Fresh Concrete as an option. We're purchasing from IKEA in the US and I don't think they offer that. Ok, so here we go. Day 1 stain test. 2pm PST. I decided to add in an additional test of lemon juice since we use a lot of citrus in our home. 1. The surface definitely makes a difference. The drops of liquid dispersed immediately on the Nougat sample, whereas they stayed in place on the honed surfaces. 2. 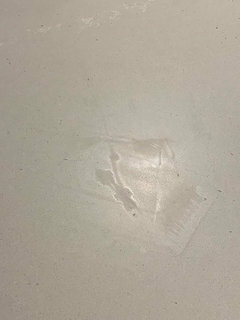 The water, lemon juice, plate scratch and greasy fingerprint were nearly invisible on the smooth surface. I decided to give it about 24 hours as a worst case scenario of a mess being left on the countertop, so I'll check back in tomorrow evening. great to see that you are testing it first. I read all the pros and cons on this thread before making decision. 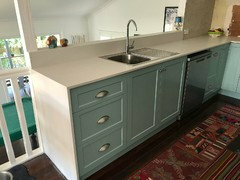 Initially I had ordered Fresh Concrete for all my kitchen bench tops, island bench, laundry and bathroom vanities. 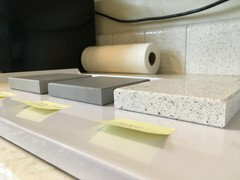 In the end, I decided to go with French Concrete for my island as that was the star item in the kitchen and for my vanities but changed the kitchen bench tops to Caesarstone Clamshell, as I thought the benchtops would get more dirty and greasy. Have not regretted the decision. Fresh concrete is lovely. I liked it from the start because of the matt finish. Watermarks do come up more compared to the Clamshell but I’m ok with that. I probably would be ok if it had all been French Concrete having lived with Fresh Concrete for over 1 year. The Clamshell hides more dirt. Have attached photos of the water marks on Fresh Concrete. Comes off easily. If you want the look of concrete but without the maintenance try a laminate like Formica 'Weathered Cement' or 'Elemental Concrete'. 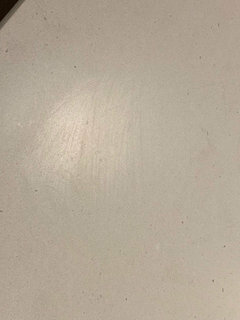 This is from their special effects laminate range and has a textured finish (images below). Unlike porous surfaces like concrete and marble the laminate does not absorb stains and does not scratch. Modern laminates have gone beyond the bland boring finishes and have been able to perfectly replicate the look of finishes like stone, timber and concrete without any of the maintenance issues associated with these materials. 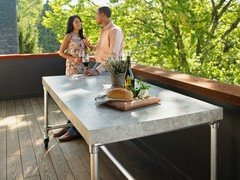 The concrete laminate look is very authentic and being high pressure laminate the maintenance is minimal. Formica also have marble and granite laminates for those looking for a marble finish without the issue of staining. My first attempt at cleaning was with a wet, nonabrasive paper towel. It did a decent job on all three, better than I had expected. 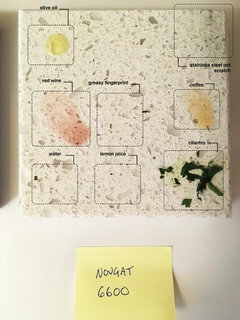 Nougat was nearly wiped clean except for a hint of green from the cilantro. The major offenders seemed to be the oils and the pot scratches. See below. Second attempt was with Windex and same paper towel, which cleaned the two honed surfaces up pretty well. The lighter Raw Concrete seems to have been easier than the Sleek Concrete. And finally, to get rid of that pot scratch I used a non-scratching Scotch brite pad (what we usually use on dishes) with some diluted Soft Scrub. This one took a little more elbow grease but I'm satisfied with the results. My opinion is that comparing the two surfaces (honed vs. glossy) there is a marked difference. That being said, I currently have tile from 1978 and grout lines that are so deep and narrow I have to scrub them out with a toothbrush. I guess it's all a matter of perspective. We decided to go with the Raw Concrete after all, and like others have said, just expect that it'll take a little more work and show a few more stains. But then again, isn't that the whole point of concrete? That it looks industrial? I hope this has helped someone. If anyone is interested I'll try to post some more photos and real life feedback in a couple of weeks once ours is installed. awesome that is such a great test and helps me also confirm my decision to go with raw concrete and live with the industrial look. Thanks for your time and effort! Arden, thanks very much for the photos and write-ups. Your experiment has been extremely helpful to me. Ours is a heavily used kitchen. We don't use any chemical cleaners at all, so before we get this, we need to understand what natural cleaners will work best on this raw concrete look. 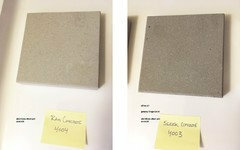 Has anyone used the rugged concrete from @ceasarstone or the valour from @stoneambassador??? Interested to hear any feedback on these two? The valour is a textured finish not smooth. We're ditchin' our kitchen. What would work? Kitchen Splash - have we undone our good work? Will an extension work for our home?